London Explorer is available for both iOS and Android. It’s an interactive way of exploring over 100 of London’s famous, quirky and vanished places. It’s also *FREE*, so take the opportunity to test it out. I’ll update it from time to time, when I get the opportunity. Download it now for Android on Google Play or the Amazon Appstore for Android, and for Apple iOS in the Appstore. London Streets, is available (also free) for both iOS and Android. It provides an interactive journey of exploration through the old streets of London, their origins and history. Version 1.1 added over 20 new streets, several new historic maps and a range of improvements and enhancements. The app uses a variety of interaction techniques – from tap/touch to view full-screen images, to pinch-zoom in/out to see more detail, to sideways swipes to reveal more images and the use of a lens able to “see through time”. London Streets is optimised for larger screens and more recent devices – and at its best on tablets. sonic London is an app for Windows mobile. 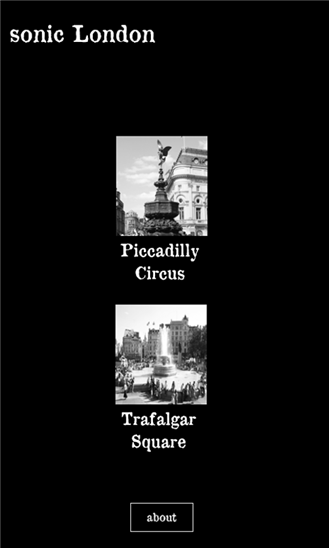 It contains original sound recordings from 2 well-known city locations – Piccadilly Circus and Trafalgar Square. Each location has 20 alternative, processed versions of each sound. It provides the chance to explore what is often ignored – the aural aspects of a location rather than the visual – and to consider hidden aspects of the soundscape, and the sounds that may have existed in these famous locations in the past. Each sound can be played on its own and can be tapped on/off. More than one sound can be played at the same time by tapping more than one “bubble”. The bubbles animate when a sound is playing and stop when it is not. Each of these 20 sounds varies each time it is played. The original sound can also be toggled on/off by tapping on the ‘original sound’ checkbox at the bottom of the screen. sonic London can be downloaded from the Windows Phone app store.